In bid to maintain Iran nuclear deal, EU works with Iran to continue trade while helping businesses evade US sanctions. The European Union vowed to help Iran evade economic sanctions imposed by the US, shielding companies doing business with the rogue state in an effort to preserve the Iran nuclear deal. European Union leaders met with Iranian Foreign Minister Mohammad Javad Zarif Monday night at the United Nations, ahead of the opening of the General Assembly’s 2018-2019 session, to plan the establishment of a system for evading US economic sanctions. As part of the 2015 Joint Comprehensive Plan of Action, Iran secured sanctions relief from the six signatory nations – the US, UK, Russia, France, Germany, and China – along with the European Union. This May, however, President Donald Trump withdrew the US from the controversial nuclear deal, vowing to reinstate “powerful sanctions” on Tehran. "The agreement was so poorly negotiated that even if Iran fully complies, the regime can still be on the verge of a nuclear breakout in just a short period of time. The deal's sunset provisions are totally unacceptable,” said President Trump. The US announced that sanctions would be restored in full on November 4th, and urged trade partners to end imports of Iranian oil by that date. "We are asking them to go to zero,” a State Department official said. “We're going to isolate streams of Iranian funding and looking to highlight the totality of Iran's malign behavior across the region." Despite American plans to reimpose sanctions, last month the European Union called for an expansion in trade with Iran. "We are doing our best to keep Iran in the deal, to keep Iran benefiting from the economic benefits that the agreement brings to the people of Iran because we believe this is in the security interests of not only our region, but also of the world," said European Union foreign policy chief, Federica Mogherini. On Monday night, Mogherini met with Zarif in the UN and vowed to shield companies doing business with Iran from US sanctions. 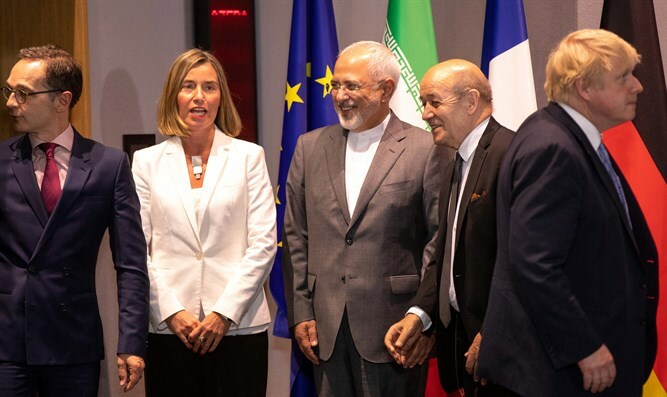 The “EU member states will set up a legal entity to facilitate legitimate financial transactions with Iran and this will allow European companies to continue to trade with Iran in accordance with European Union law and could be open to other partners in the world,” Mogherini said. The move comes after a number of European companies announced plans to end operations in Iran due to the return of US sanctions. On Monday, Swedish carmaker Volvo said it would close down operations in Iran, where it assembled some of its trucks, in response to US plans to reimpose sanctions. “With all these sanctions and everything that the United States put (in place) ... the bank system doesn’t work in Iran. We can’t get paid ... So for now we don’t have any business (in Iran),” Volvo spokesman Fredrik Ivarsson told Reuters. On August 23rd, British Airways and Air France both announced that they were cancelling their routes to Tehran by the end of September.